The Kelowna Rockets will be without Jackson Whistle, their starting goaltender, for a week or two, or maybe even three, after he underwent an appendectomy on Friday night. Larry Fisher of the Kelowna Daily Courier reports that Whistle had the surgery after making 22 saves in a 5-3 victory over the visiting Kamloops Blazers. . . . Whistle, 19, is 31-7-3, 2.47, .913 this season.
. . . Without him, the Rockets will go with Jake Morrissey and Michael Herringer. . . . Morrissey won 5-2 in Kamloops on Saturday and beat the visiting Prince George Cougars 5-2 on Sunday. 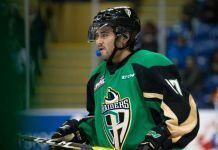 He is 6-1-1, 1.97, .933 in nine appearances. . . . Herringer, who may start tonight against the host Seattle Thunderbirds, is 5-0-0, 2.46, .902 in six games. The Medicine Hat Tigers may have F Steve Owre back in the lineup when they play host to the Regina Pats tonight. Owre, who has 34 points in 36 games this season, has been out since Dec. 28 with a broken jaw. . . . The Tigers will be without D Tyler Lewington, their captain, as he serves a one-game suspension for instigating a fight in the last five minutes of Saturday’s 4-1 loss to the visiting Lethbridge Hurricanes. The junior B Golden Rockets of the Kootenay International Junior Hockey League are looking for a general manager/head coach. 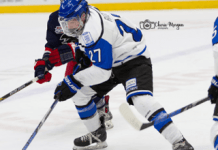 Ty Davidson has informed the team that he will be leaving after the club’s spring camp in Salmon Arm, May 7-9. . . . Davidson is the son of Everett Silvertips general manager Garry Davidson. . . . The Rockets already are accepting resumes for the position. Here’s your horror story for the day. Former Dallas Cowboys running back Tony Dorsett is living with CTE. As he says in this piece , he didn’t know the end was going to be like this. In Victoria, G Justin Paulic stopped 34 shots to help the Royals to a 2-1 victory over the Edmonton Oil Kings. . . . Victoria F Austin Carroll broke a 1-1 tie with his 29th goal at 12:55 of the second period. . . . Royals F Jack Palmer scored his fourth goal at 7:58 of the first. . . . Edmonton F Lars Eller ended an 18-game drought when he scored for the first time since Nov. 29. He got his fourth goal of the season at 1:59 of the second, on a PP. . . . Victoria lost F Taylor Crunk at 19:55 of the first period when he was given a fighting major and game misconduct. It was a one-man scrap. . . . G Patrick Dea, in his second straight start for the Oil Kings, stopped 20 shots. . . . Victoria F Brandon Magee played in his 300th regular-season game. 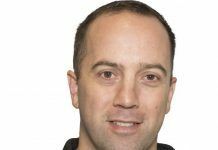 He is the first player in Chilliwack/Victoria franchise history to reach 300 games. . . . Victoria equipment manager Matt Auerbach worked his 700th WHL game. 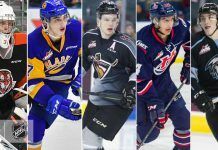 He spent one season with the Regina Pats and the rest with the Chilliwack/Victoria franchise. . . . The Royals (30-20-4) have won four in a row. . . . The Oil Kings slipped to 25-25-6, but remain in possession of the Eastern Conference’s first wild-card spot. They are one point ahead of the Kootenay Ice. . . . “I thought we did some positive things today, but that’s a big strong team,” Edmonton head coach Steve Hamilton said on the team’s website. “We certainly weren’t overwhelmed, but we had a hard time generating offence. I think it’s been a consistent theme with us: not establishing an interior presence. We were at times today satisfied with the long shot without any traffic, and so at times weren’t generating any extra opportunity for ourselves.” . . . 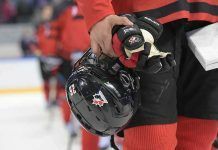 In Kamloops, G Connor Ingram stopped 27 shots as the Blazers beat the Tri-City Americans, 3-0. . . . Ingram, a 17-year-old freshman, has three shutouts, two of them against the Americans. He beat them 2-0 with a 25-save performance on the road on Oct. 25. That was his first shutout. . . . The Blazers scored two first-period goals and the Americans never got into this one. F Deven Sideroff, his 17th, and F Cole Ully, his 28th, on the PP, scored by getting the puck into the crease and having it change directions. . . . Tri-City G Eric Comrie, who stopped 24 shots, had little chance on either. . . . Ully also had an assist, while D Brady Gaudet had two assists. . . . Tri-City head coach Mike Williamson pulled Comrie for the extra attacker at 4:33 of the third period while on the PP. The Americans were all around Ingram but couldn’t beat him. He made especially sharp stops on F Brian Williams (glove) and F Beau McCue (pad). . . . Williams played for the first time since being injured on Jan. 16. . . . The game was slowed by 16 minor penalties and two fights. . . . The Americans lost F Parker Bowles early in the first period when he left for the dressing room with his left arm hanging by his side. Bowles leads the team in assists (31) and points (44), in 47 games. . . . Tri-City F Justin Gutierrez missed a chunk of the first period after taking a clearance by D Justin Hamonic on the left side of his head at 11:30. Gutierrez returned late in the period. . . . 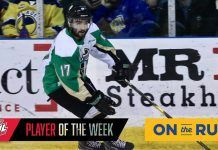 The Blazers were without F Quinn Benjafield, who drew a ‘tbd’ suspension for a headshot on Kelowna F Tyson Baillie on Saturday night. Also missing was D Patrik Maier, who may have at least a bruised tailbone after taking a hit from Kelowna F Tyrell Goulbourne late in the third period on Saturday. . . . After going 0-4-0 in the season series a year ago, the Blazers went 3-1-0 this time around. . . . Kamloops (21-29-6) snapped a three-game losing skid. The Blazers are third in the B.C. Division, a point ahead of Vancouver and three ahead of Prince George. . . . The Americans, who hold down the Western Conference’s second wild-card spot, are 25-26-3. . . . In Vancouver, F Tyler Benson snapped a 4-4 tie at 16:18 of the third period as the Giants scored a 5-4 victory over the Seattle Thunderbirds. . . . Benson, who scored the winner on a breakaway, has 13 goals. . . . Seattle F Ryan Gropp had tied the game with his 22nd goal at 11:33. . . . F Jakob Stukel had given Vancouver a 2-1 lead with his fourth goal at 19:02 of the second period. . . . The teams then combined for six third-period goals, alternating them right to the end. . . . F Jackson Houck scored his 17th goal and added an assist for Vancouver. . . . F Cory Millette got his 15th goal, via the PP, and had an assist for Seattle, which got three assists from D Shea Theodore. . . . Vancouver G Cody Porter turned aside 26 shots. . . . Seattle G Logan Flodell made his fourth career start, but his first against a team other than Prince George. He made 29 saves, including 16 in the first period. . . . 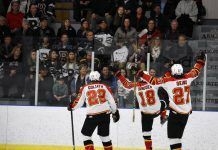 The Giants are 22-29-3 and one point behind third-place Kamloops in the B.C. Division. . . . Seattle (27-20-6) had a four-game winning streak end. . . . The Thunderbirds, who are third in the U.S. Division, now head home to Kent, Wash., and a date tonight with the Kelowna Rockets. That will be Seattle’s fourth game in five nights. . . . In Kelowna, F Rourke Chartier regained the WHL goal-scoring lead and the Rockets moved back into first place overall as they beat the Prince George Cougars, 5-2. . . . The victory left the Rockets with one more point than the idle Brandon Wheat Kings. Kelowna holds one game in hand. . . . Kelowna D Josh Morrissey broke a 2-2 tie with his ninth goal at 8:21 of the third period. . . . Chartier scored his 44th goal at 10:43, on a PP. That moved him one goal ahead of Medicine Hat F Cole Sanford. . . . Rockets F Dillon Dube added more insurance with his second goal of the game, on a PP, at 15:14. Dube has 14 goals. . . . The Rockets were 3-for-9 on the PP; the Cougars were 1-for-6. . . . Cougars F Chase Witala scored his 27th goal and added an assist, while F Jari Erricson got his 18th. . . . Kelowna F Justin Kirkland had two assists. . . . The Rockets held a 15-3 edge in shots in the first period. . . . Kelowna G Jake Morrissey made back-to-back starts for the first time in his WHL career. Jackson Whistle, the No. 1 goaltender in Kelowna, has an undisclosed injury. Morrissey stopped 22 shots, eight fewer than Prince George’s Ty Edmonds. . . . Rockets F Tomas Soustal took a charging major and game misconduct as the third period ended. . . . Kelowna F Tyson Baillie was scratched after taking a headshot from Kamloops F Quinn Benjafield on Saturday. . . . The Rockets (41-8-4) 7-0-1 will meet the Seattle Thunderbirds tonight in Kent, Wash. It will be the fourth game in five nights for both teams. . . . The Cougars (21-32-3), who are three points out of B.C. Division playoff spot, are 1-1-1 in their last three games. Spokane at Saskatoon, 7;05 p.m.
Kelowna vs. Seattle, at Kent, Wash., 7:05 p.m.